If you are surfing the internet while looking for soda cracker recipes or some such, you need to keep surfing. 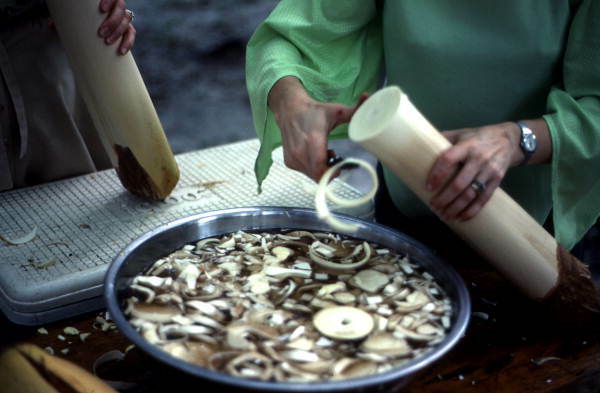 This page is about how the early pioneer Florida Crackers used to prepare their meals and some still do. These Crackers came down from the southern states, many of them just after the Civil War. Florida was harsh country back then, and these pioneers learned to live off the land and prepare their food in the simplest possible ways. 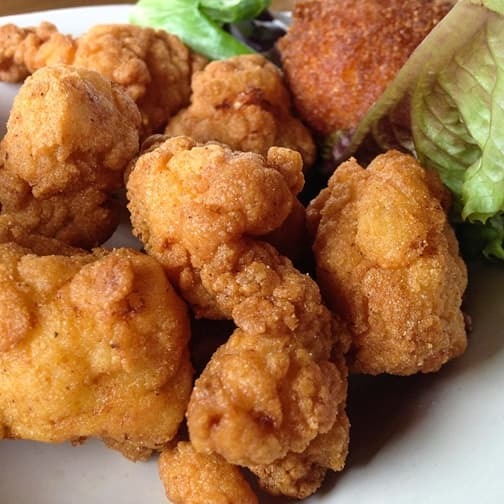 Here is a collection of some Florida Cracker recipes. Some are courtesy of Central Florida Memory (cfmemory.org), others from "Cross Creek Cookery" by Marjorie Kinnan Rawlings, and still others from our website visitors. Wash peanuts to remove any dirt. Make a brine solution of the salt and water. Add peanuts, making sure there is enough brine solution to cover. 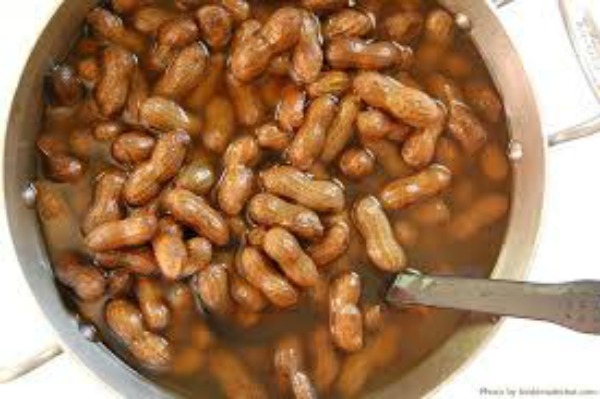 Bring to a boil, cover, and boil until peanuts are tender. This will vary from 2 to 4 hours. Check water every 30 minutes or so. You may need to add water to make sure peanuts remain covered with brine solution. When peanuts are tender, drain, and eat them from the shell. They are messy, but, boy, are they good. Some folks like spicy boiled peanuts. Just add a few hot peppers or some hot sauce to the pot while peanuts are boiling. Combine 1 cup of stone-ground cornmeal with ½ tsp. salt and enough hot water to make a stiff batter. Form one large cake or several small ones about ½ inch thick. Fry in bacon fat or butter until brown, turn, and fry other side until done. Add onion, egg that has been beaten, salt and pepper and mix together. Add enough buttermilk to make a heavy batter. 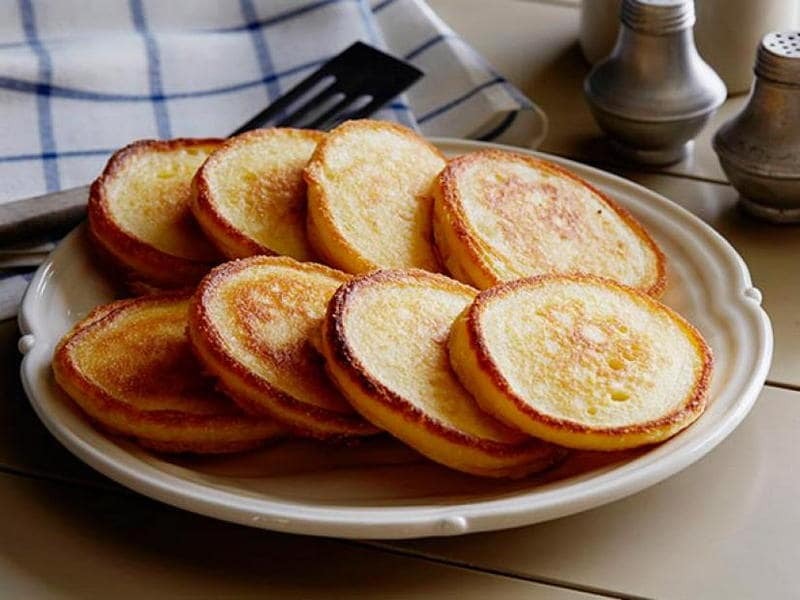 Batter may be divided into several small pones, or formed into one large one. Fry in bacon fat or oil over medium heat until light brown. Turn and cook until done – about 3 minutes on each side. Mix cornmeal, baking powder, and salt. Add onion, a well-beaten egg, and enough water to hold batter together. 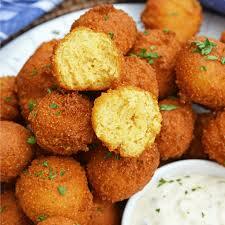 Shape into small balls and fry in very hot fat or oil until golden brown. Serve hot. Only the meat from the tail is fit to eat, and it’s tough as shoe leather. Slice meat into thin (1/4 inch) strips. Pound to tenderize. Dredge in some cornmeal or flour seasoned with salt and pepper. 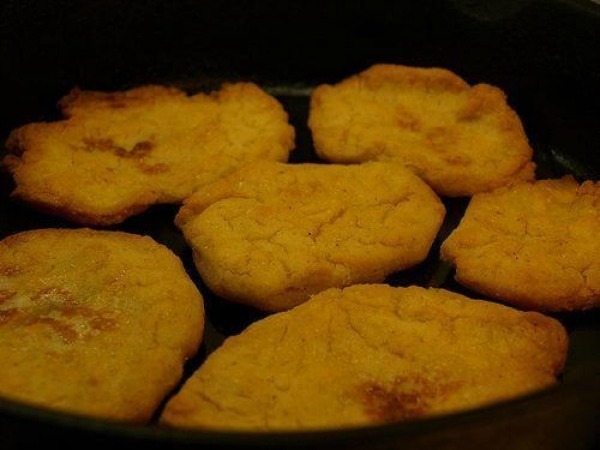 Fry in bacon fat or vegetable oil in a hot skillet for about three minutes on each side. Another way to prepare alligator is to simmer meat for several hours over low heat, together with onions, peppers, tomatoes, a few bay leaves, and a few shots of hot pepper sauce. The slow cooking helps tenderize the meat and pick up the flavors. Warning: Gopher Tortoise is a protected species, so you will have to use pork instead. Dredge 1” cubes of meat in seasoned flour. Brown meat in fat rendered from half of the salt pork in a Dutch oven. Set aside. In a skillet, fry remaining salt pork to render fat. Add onions and peppers, and fry until soft. Add about a quart of water to the gopher meat in the Dutch oven, and stir to make gravy. Add onions and peppers, bay leaves, and pepper sauce, and simmer over low heat for 2 hours. Taste, adjust seasoning, and serve hot over rice. Mix all ingredients except ribs into a sauce. Place ribs on a rack in a pan of water and steam for 45 minutes. Put sauce in a pan and cook over medium heat until reduced by half. Remove ribs from pan of water and transfer to grill, or place in a shallow pan in a 350 degree oven. Baste with sauce and cook until tender. At serving time, top with remaining sauce & garnish with orange slices. Salt and pepper fish and bring to room temperature for at least an hour before frying. This will keep the oil from cooling down when fish are added to the fat. Dredge fish in cornmeal. Shake away any excess, and place in oil, a few at the time. Fry for 4 or 5 minutes. Drain, and serve hot, with hushpuppies and cheese grits. Mullet can be cooked the same way. Wash and remove the stems from a bunch (2 lbs.) 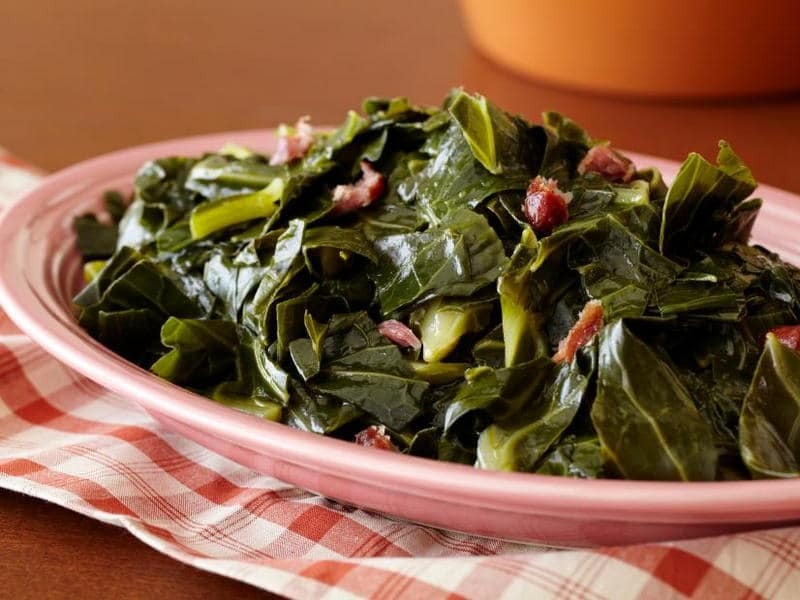 of collards. Chop coarsely with kitchen shears. 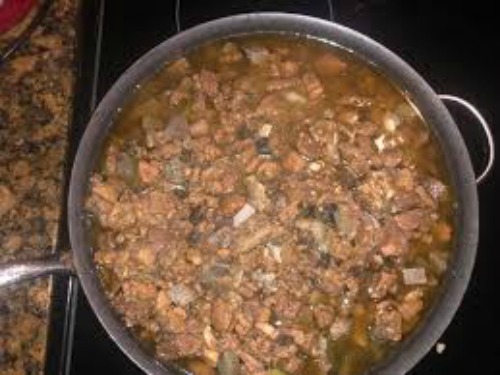 Put a quarter pound of seasoning meat into one gallon of boiling water and simmer 15 minutes to flavor stock. Add greens, a few at a time, so that all are blanched, and then simmer over low heat. Add one small onion (chopped fine), a dash of hot pepper sauce, and salt and black pepper to taste. Cook over medium heat until onion is soft, about 15 minutes. Greens will still be crisp, with garden fresh flavor. Cut off tips and stems from young pods, and then cut into ½ inch slices, cutting across the pods. Season cornmeal with salt and pepper. Add okra, a few at the time, to cornmeal, and coat well. Heat enough bacon fat or vegetable oil in a skillet to a depth of about a half an inch. 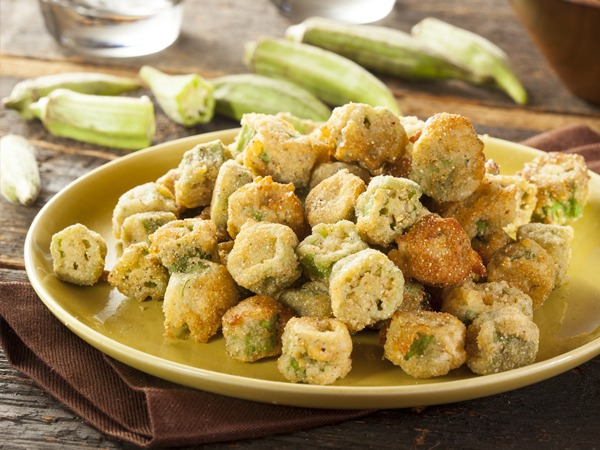 Add okra and fry until golden brown, stirring with a wooden spoon, about six to eight minutes. Hearts of palm is available today in grocery stores. In the old days it was called swamp cabbage. The bud cut from a sabal palm is still called swamp cabbage. Most people would rather look at their palm trees than eat them. There was a time, however, when swamp cabbage might be the only green vegetable a cracker could put on the table. It is still served in hunting camps and at Cracker Day celebrations such as the annual Swamp Cabbage Festival in LaBelle. If cabbage palms are being removed from a construction site, you might be able to cut your own cabbage. The best ones come from trees that are from eight to twelve feet tall. This recipe comes from Oliver Winn, a fourth generation Floridian. 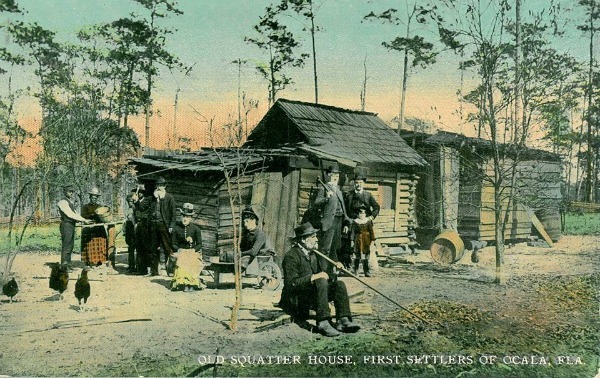 The Winns were pioneers in the early days of Volusia County. Cut a four-foot section from just below the fronds. Pull away the boots and peel down to the heart. It will be about 3 to 4 inches in diameter, ivory in color, and crisp like fresh stalks of asparagus. Break heart into bite size chunks and soak in cold water until ready to cook. Chop some onions. Fry a ½ pound piece of salt pork, cut into small pieces, in a skillet. Add a handful of onions and some butter and cook until onions are soft. Meanwhile, in a Dutch oven, melt a stick of butter. Add a generous amount of swamp cabbage and a fourth of the onions from your skillet. Season with salt and pepper to taste. Add more cabbage and onions, in the same portion, until pot is half full. Cook over low heat for about 30 minutes, stirring with a spoon to keep cabbage from burning. Serve when swamp cabbage is tender. Note: True Florida Crackers will look down their noses at using hearts of palm from a grocery store rather than cutting your own in the wild. Eating black-eyed peas first thing on New Year's Day is a southern tradition. Do this, they say, and you will have good luck all year long. 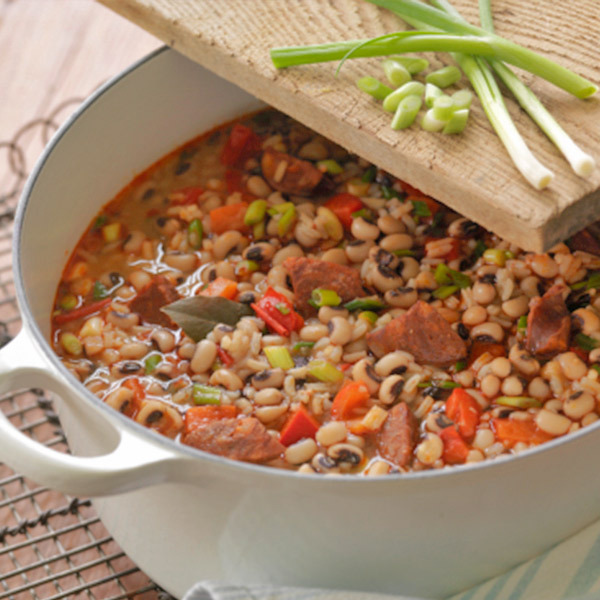 Hoppin' John is a good way to prepare this good luck holiday treat. Rinse well in morning, drain, and place in a pot with water and bring to a boil. Reduce heat, add seasoning meat, pepper sauce, and salt and pepper to taste. Meanwhile, cook onions in bacon fat until soft and then add to peas. Cook over low heat for about 30 to 45 minutes. Check water level and add rice, so that there is at least 2 cups of liquid for one cup of rice. Reduce heat, cover pot until water is absorbed and rice is tender (about 20 minutes). Good Luck! 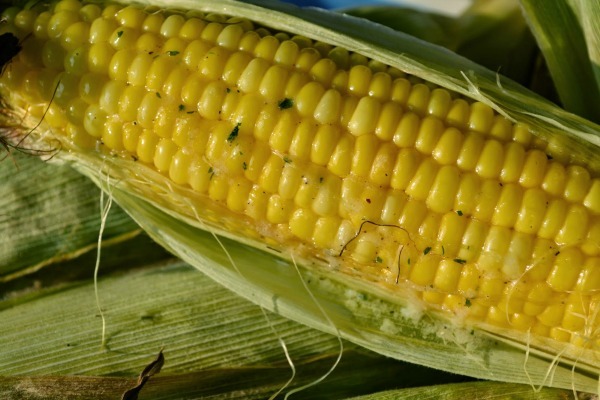 When sweet corn comes in, nothing is better than roasting ears. Just pull back the husks, remove silk, secure husks back around the kernels, and soak in water for an hour. Just before cooking, peel back husks, salt and pepper to taste. Secure husks with a bit of string, and add to the coals or place on the grill. The corn will steam and the kernels will melt in your mouth. Cooking time will depend on heat of the fire, usually about 10 minutes. The Zellwood Corn Festival in Central Florida had this art mastered in the old days, but now most of the area's corn farms are gone. Preheat oven to 350 degrees. If using canned sweet potatoes, drain and mash. If using raw potatoes, peel, boil until tender, and then drain and mash until smooth. Combine all ingredients, stir together and mix well. Place in a greased baking dish. Bake for 1½ hours. Pick a ripe melon. Cut it in half. Scoop out the melon balls with a spoon or melon-baller. Scrape out shell. Combine melon balls with a cup of sugar syrup (see recipe for Sour Orange Drink) and a cup of sour orange or lime juice. Return melon to shell and garnish with mint and citrus fruit slices. 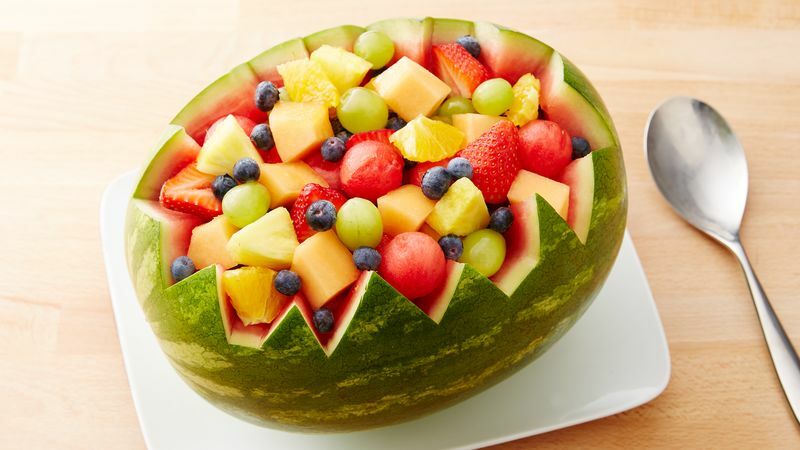 For a more colorful presentation at a party, add honeydew melon, cantaloupe, pineapple, and other tropical fruit. The Spanish brought Seville oranges to Florida, planting them in St. Augustine as soon as they arrived. Within a few years they escaped into the surrounding forest. This tart flavored citrus, called sour oranges by many, spread throughout Florida where both natives and Crackers took to them with a relish. 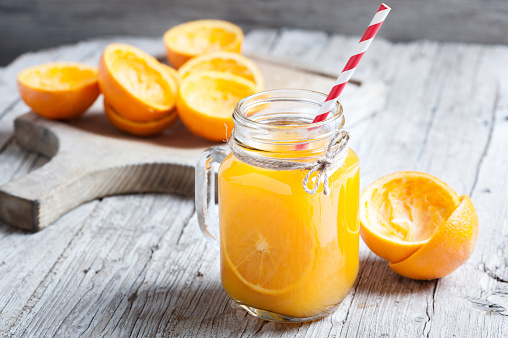 Wild oranges make a great beverage. Combine everything, mix well, and serve over ice. To make sugar syrup, combine equal amounts of water and sugar and heat until dissolved. Grate zest (skin) from oranges and set aside. Squeeze juice and set aside. Cook onions over low heat in oil until soft. Add zest and garlic, and cook another couple of minutes. Add remaining ingredients and bring to a boil. Immediately reduce heat and simmer for 10 minutes. Remove from heat and cool. For best results, marinate chicken, fish, or meat in sauce for several hours before cooking. At cooking time drain marinade and place food on grill. Baste with sauce occasionally. Additional sauce may be added at serving time. A Florida Cracker never wasted anything, especially a watermelon. Not many folks make pickles anymore. This recipe is worth the trouble. Cut off green skin and scrape away any of the pink flesh left on the inside of the rind. Cut rind into 1 ½ inch cubes and rinse in water. Soak melon cubes in a cup of salt and enough water to cover for 10 to 12 hours. Pour off water. Dissolve sugar in vinegar and bring to a boil for a few minutes. Add cinnamon and cloves and simmer until mixture becomes syrup, about 2 hours. Add watermelon cubes and simmer for an hour. Fill sterilized jars and seal. Niceville, Florida is in the panhandle and has a annual mullet festival. They really know how to cook their mullet in that part of Florida. Wash cleaned fish, which should be butterflied or filleted. Salt and pepper generously. Fry in deep, hot peanut oil (350 degrees) for 3 to 5 minutes, turning if necessary or until fish flakes easily when tested with a fork. Fish will be golden brown. Drain on absorbent paper. Use a large, deep pan to avoid crowding fish. Turn fish once when crisp and golden. For fillets, brown skin side last. 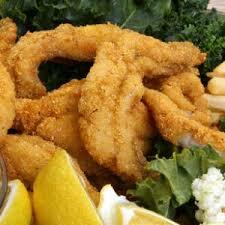 After frying, drain fish immediately on paper towels to remove fat. "I associate soup with either poverty or formal elegance. The poor make a meal of it. The elegant dabble in it, beginning a long dinner of main courses with a cup or plate of it, aggravatingly small if the soup be good. One small serving of a ravishing soup is infuriating. It is like seeing the Pearly Gates swing shut in one’s face after one brief glimpse of Heaven. Fortunately, Cubans are generous folk, and I have been able to bring home to the Creek backwoods the recipes for these hearty and delicious soups. Those of the Mayor’s wife are the best in Tampa." Add soda to water and soak beans overnight. Wash beans well the next morning. Cover ham hock well with cold water, add beans and start cooking slowly. Cut up onions, garlic, bell pepper, and in about twenty minutes add to soup together with bay leaves and saffron. Cut sausages in pieces of four each and add to soup. Cut pig’s feet in half, lengthwise, and cook separately until tender; then add to soup and cook slowly. Cut up potatoes and add to soup, and when beans are about done, cut up cabbage as for slaw and add to soup. Season to taste with salt and black pepper. Be sure to cook slowly always. More water may be needed at end, but soup is supposed to be very thick. Many Florida crackers were cowboys, or as they called them back then, "cow hunters'. Sometimes they'd be out on the range for days or weeks rounding up cattle, branding them, and getting ready to drive them across the state to Punta Rassa and other cattle exporting ports. Here might be a typical breakfast they cooked over the campfire early in the morning. Make sure the flames are down in the campfire and that there are nice hot coals. In a cast iron skillet, cook the bacon until it's crispy. Set the bacon strips aside. Put the diced potatoes into the skillet, stir and cook in the hot bacon fat until the potatoes are soft. Then break the bacon slices into the skillet on top of the potatoes. Stir in the beaten eggs. Cover the skillet and cook until the eggs are set up. Usually takes 2 or 3 minutes. Take the cover off and sprinkle the cheddar cheese on top until it melts. Serve and enjoy. Adjust quantities up or down depending on the number of cowboys. NOTE: The recipes above came from several sources, including a PDF file from Central Florida Memory. Many of them are from B. Raynor and C. Raynor on the website www.tasteofstaugustine.com. Others are from website visitors who use the form below to submit recipes. Have A Florida Recipe You'd Like to Share? Tell us about your favorite recipe. We'd prefer it to have a Florida flair, but we promise to take a look at everything.